Dr. Ono is Board Certified in Radiation Oncology by the American College of Radiology and joined Ironwood Cancer & Research Centers in 2005. He was formerly an Assistant Professor at Oregon Health and Science University and was the Medical Director at the Tuality/OHSU Cancer Center. Dr. Ono attended the University of Illinois at Chicago, where he earned his medical degree and completed specialty training in Radiation Oncology at Thomas Jefferson University Hospital in Philadelphia where he served as the Chief Resident. He is a medical expert consultant to medical insurers, performing peer reviews regarding standards of care in cancer medicine. His areas of expertise include 3-D conformal radiotherapy (3-D CRT), Intensity Modulated radiotherapy (IMRT), Image Guided radiotherapy (IGRT), brain tumors and stereotactic radiosurgery (SRS), stereotactic body radiotherapy (SBRT), breast and prostate brachytherapy and clinical trial protocols. 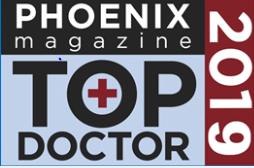 Dr. Ono has been recognized by Phoenix Magazine as “Top Doc”. Dr. Ono sees patients for Radiation Oncology at our Mesa (Arbor) location.